Posted on 5, February 2019 by EuropaWire PR Editors | This entry was posted in Art & Culture, Automotive, Entertainment, Germany, Internet & Online, Marketing, Media, News and tagged ad campaign, ad spot, advertising, antoni garage, Bettina Fetzer, British Indie-Pop band Catholic Action, D.A.R.Y.L., David Wilmot, For everything that comes, Hannah Edwards, Jacqueline Abrahams, Justify nothing, Lol Crowley, Mercedes-Benz B-Class, Mercedes-Benz Cars, Sam Ostrove, sports tourer, the new B-Class, TV-Spot. Bookmark the permalink. STUTTGART, 5-Feb-2019 — /EuropaWire/ — The market launch of the new Mercedes-Benz B-Class is going to be supported by a TV spot broadcasted on both TV and online starting from 4 February, 2019. The ad spot is also available on the B-Class webhub. In addition to the main ad spot, three 30-second variants have also been created with emphasis on safety, MBUX and practicality. The main character in the one minute ad spot is a university professor who takes his small grandson to work with him. The role of the professor was played by the Irish theatre and film actor David Wilmot. Hi will soon also appear in the series “The Crown”, which was awarded a Golden Globe in 2017. The content’s insights into various life situations create a human-centered and authentic impression, with surprising moments. 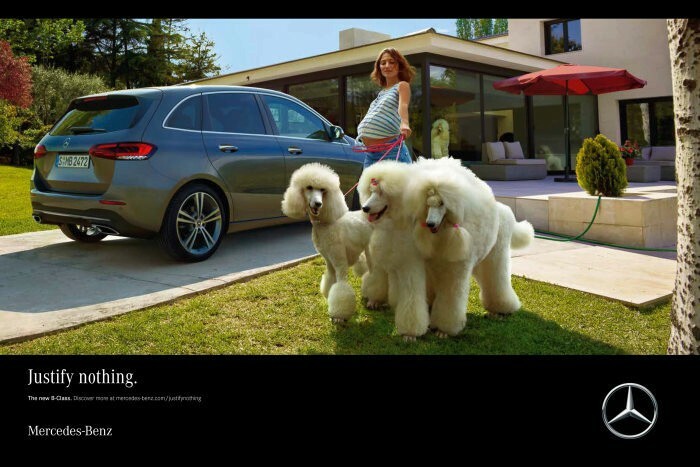 The ad campaign claim is “Justify nothing” while in Germany the campaign has the theme “For everything that comes“. The short clips for the B-Class campaign were directed by the London-based duo D.A.R.Y.L. and created by an award-winning film crew (Sundance Film Festival, Cannes Film Festival), which included cameraman Lol Crowley (4 Lions), production designer Jacqueline Abrahams (The Lobster), costume designer Hannah Edwards and Sam Ostrove. Sam Ostrove was responsible for the screenplay of the much-acclaimed Jay Z & Beyoncé music video “Apes**t”. The song “L.U.V.” by the young British Indie-Pop band Catholic Action from Glasgow is used for the musical background to the TV spot and the online short versions of the film. The music in the long version of the launch film is a composition by Orlando Weeks, A British Indie-Rock singer. The print motifs, part of the ad campaign, also portray different life situations that are quite common in the 21st Century and have been photographed by the Briton Dan Burn-Forti. 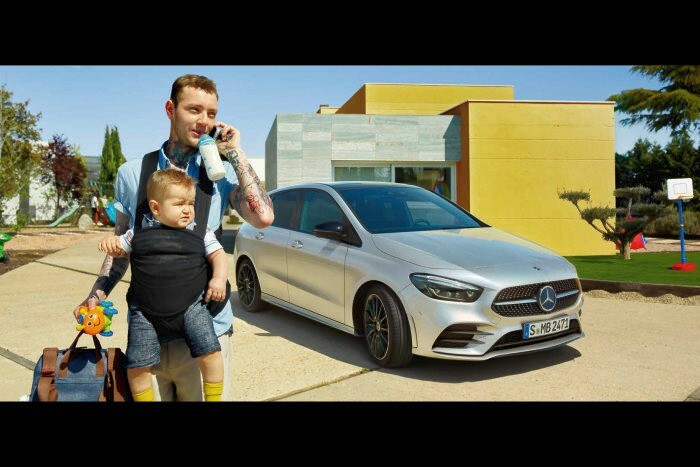 The idea, conception and implementation of the ad campaign for the new B-Class were by antoni garage, the European creative lead agency for Mercedes-Benz. The new Mercedes-Benz B-Class comes with transverse-mounted version of the two-litre OM 654 diesel engine model series with 110 kW and 140 kW. The engine complies with the Euro 6d standards, which will be mandatory for new models stating from 2020. The eight-speed dual-clutch transmission also makes its debut. Advanced driving assistance systems give the B-Class one of the highest standards of active safety in the segment with functions carried over from the S-Class. The new B-Class has begun taking orders since 3 December 2018, with first deliveries due to begin in February 2019.